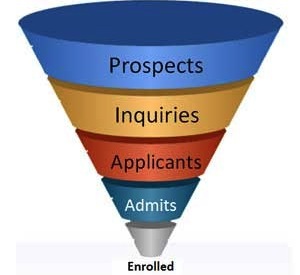 Why approach admissions funnel development strategically? Identify new audiences who may not yet have enough information about your offerings, and learn what motivates them to pursue your program. In today’s climate, what should we do to keep our admissions pipeline healthy for the near and long terms? Where are critical points in a student’s decision-making process where our message might resonate most effectively? Which information sources do our prospective students rely on most? How do prospective students envision their futures with our degree on their resume or CV? How might we leverage our school identity or brand in ways that attract students? Learn which program assets students find most appealing, and why. Isolate areas for additional outreach, message re-development, or resource re-allocation. Assess perceived strengths and weaknesses at each stage of the funnel from inquirers, applicants, and non-matriculates. Understand where students look for information, and discern what information most affects their decision processes. Identify specific competitor strategies or offerings that draw students’ attention away from your program, and why. Develop new game plans for differentiating your program and attracting candidates. Explore the needs of untapped student populations, and learn how you might satisfy them. Recognize specific social, cultural, or economic trends that may affect students’ pursuit of your programs.